I have a long and checkered past in the culinary disasters department, which I thought I would share. Each disaster is such an "event" that it has its own name. Enjoy - - and take heed! This is one of my early - - maybe even the first - - culinary disaster. Now, bear in mind that I left home knowing how to boil water and make chocolate chip cookies! The frugal daughter of frugal parents went to the grocery store to get a chicken for chicken and noodles. "Buy a stewing hen," said Mama. "They're always cheaper per pound than a fryer." So I got my hen and tucked her up in the freezer against the day I craved chicken and noodles. Unfortunately, the day I craved BBQ chicken arrived first. I got my chickie out of the freezer and didn't look at the label or the weight or anything! (And what would I have known to do with that information had I read it?) Thawed out the creature and cut it in pieces (-this- was a world-class event in itself!). Mixed up some BBQ sauce (from scratch, yet! ; of course, from a cookbook) and put the chicken on the grill. Boy, did it smell great! I could hardly wait to eat it! Ah! With cole slaw and corn on the cob, too! When I bit into a piece, my teeth bounced back! The skin was -so- rubbbery and tough that I couldn't get my teeth through it! A total disaster. Completely inedible. I threw it out. Mama (after the fact): "Oh, no, you never bake or broil or BBQ a stewing hen! They're too tough for anything but cooking a long time in water!" I've remembered that. In fact, I don't think I've bought a stewing hen since! This is another college-days adventure. For some reason, I decided I wanted to see what popcorn looked like while it was popping. How do you do this? Why, you lift the lid on the pot!! Scientific curiosity created a mess. This one I had forgotten, and I was reminded of it. As you read on, you will discover that many of my disasters involve the microwave oven. Usually the microwave wins, but in this round with the hot dogs, it was a draw. The gist is that I didn't know long it took to heat a hot dog in the microwave. I must have set it for something like 3 minutes. Sometime after about 60 seconds, kaboom! I rushed to look, and the hot dog had developed little "frayed ends," kind of like the "brushes" made from green onions for garnishing Chinese food. Well, I was not going to throw out a perfectly good hot dog just because it looked a little strange. Besides, Andy was waiting for lunch! So I told him this was a gourmet treat to have exploded hot dogs. It came to me one evening that I wanted to reheat a loaf of bread that I had made earlier in the day. What better way than the microwave? The machine was just made for things like this! Well, heck. How long? Gee, maybe about 6 minutes. I have to tell you that 6 minutes is too long. I did not have a loaf of bread but a loaf of toast. The introduction of new gadgets in the kitchen brings with it the opportunity for new creativity in disasters! This noteworthydebacle was in celebration of my new breadmaker. I wanted to make sourdough bread. Why didn't the cookbook that came with the machine have a recipe for same? Good question - - to which there is a good answer: sourdough bread is not meant to be made in a breadmaker (at least in one such as I have). Now, I've made sourdough (and all kinds of other breads) by hand for years and years and have a pretty good idea how the process works. 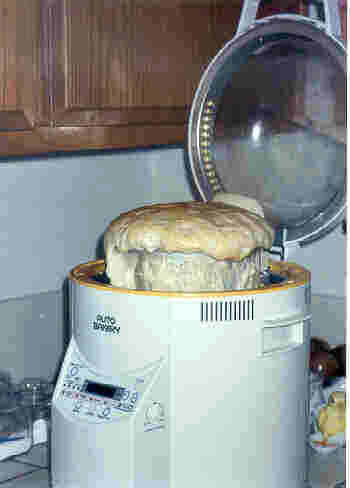 I also was familiar with my breadmaker, after all that time, and I thought I could improvise. Hah! First we need the sourdough sponge. Instead of starting that in a bowl, I'll just start it in the breadmaker, I decided. So I got my starter from the refrigerator, let it come to room temp and start bubbling (and all that). Put some in the breadmaker bowl with the flour necessary for the bread (3 c), gave it a shot of heat from the machine, and went on about my business. My, oh, my! Too bad my business didn't take me by the kitchen a little sooner! The starter had had big fun with the flour! It had filled the breadmaker bowl and oozed over the side. Not content with a real big mess in the pan, it had overflowed all around the outside of the breadmaker itself -and- filled the area between the heating coil and the bottom of the pan. Yes, it was well entwined in the coil, too. What a mess! Clean-up took -quite- a while! Speaking of bread machines, I've made a number of "doorstops," which is what we call loaves which aren't greater than about 3" tall and are so heavy they can't be cut easily and therefore qualify for use as a you-know-what. Everybody has story like this to tell: go home from college with all this new-found knowledge (culinary and/or otherwise) and impress the folks back home. I had received the first volume of Julia Child's Mastering the Art of French Cooking from my boyfriend. I was delighted, and my friends thought I was really weird to actually -like- something as strange as this! And for a birthday? Birthdays are why flowers, candy, and jewelry were invented, especially in the South! Julia's pie pastry was one of the first things I made. It came out well enough that I decided I'd show off for my parents with it. Brain went on overload or something because between the time I made it at school and the time I decided to show off at home, I forgot this recipe was for -pie- pastry and not for -pizza- dough, despite the fact that it was written right there for me in plain English at the top of the recipe. I gathered my ingredients. "-Real- butter?!" spluttered my mom. "Yes. Absolutely can't make this pizza dough without butter," I responded. "Oleo won't do?" "No. Must have real butter." That should have been my mother's first sign that she should lock me away from the stove. Instead, she produced the butter and obliged by making the pizza sauce. I followed Julia's instructions to the letter, formed the crust, pre-baked, and topped it with Mama's tomato sauce before baking again. We all sat down to dinner. My dad remarked on the "unusual" crust and said the pizza was good. I smiled graciously and said thank you. I mean, after all, all I did was follow Julia's instructions. The glory really should go to Julia, but it did turn out rather well, didn't it? It wasn't until many years later that I realized what had happened. Sophmores are not named that without a good reason! Ahtough I'll be the first to admit that I'm not very skilled at making mashed potatoes, I should be able to make at least -edible- mashed potatoes. Not real authentic Irish ones, of course, but ok in a pinch. So, I cooked my little potatoes in the hot water until they were soft and thought, Why not do these in the Cuisinart instead of dragging out the mixer, the big bowl, and all of that. What a genius! What an idiot. Had I read the instructions (ahem) I would have read that making mashed potatoes was "not recommended." I found out why. You don't get mashed potatoes - - you get potato glue! This was a delight that I prepared for guests. It was a loin of pork (one of my favorites! ), stuffed with prunes and apples, Danish style, which I got from my Time-Life Foods of the World series. (A very good series, too, incidentally, in case you have a chance to buy it in a used bookstore.) I prepared the roast just before the guests arrived and put it in the oven and turned on the timer. At the end of cocktails, I wondered why I wasn't smelling the roast cooking. Another round of drinks would have us all on our ears, so I decided I'd better check. Upon investigation, there sat the pork roast in the oven, raw as ever. Regal, but raw. I had turned on some -other- timer (goodness knows which one it was!) instead of the time-bake timer on the oven. Of course, you have guessed the solution! I put the roast in the microwave. But this time I had the good sense to consult a cookbook -and- to keep an eye on it! It wasn't as tasty as if it had been browned and cooked properly in the regular oven, but at least it wasn't raw anymore! This one still makes me weep. Not with laughter. I have a recipe for prime rib that is fabulous. (My dad, the rocket scientist, figured out this method.) You cook it for a while, with the "while" determined by the weight of the roast and how done you want the meat. Then you leave the roast in the closed oven for 2 hours. Then it's 15 minutes of reheating, and you carve and serve. Perfect every time. No turning or other contortions. And the house smells wonderful when people arrive! For some reason I do not know, I set the oven temp at 500 degrees (which is incorrect) when I did the first cooking (so I can't blame it on a cocktail). You can guess what happened. The whole darned roast was like a cinder! Everyone was -at the table- when I discovered this (smelled great and you have to keep the oven door closed, so how was I to know I had goofed?). What to do? I wondered if I should dash out and buy some steaks but decided to brazen it out, as though the plan called for ultra-well done rib roast! Thankfully, nobody made any comments or grimaces, but it was -very- embarrassing! And for that price! Thankfully, everything else turned out well, and with the b�te noire for dessert, nobody remembered the rib roast! Or at least no one's mentioned it! Note: The price goes with the year 1995. Goodness only knows what such a roast would cost today! I was boiling eggs to put in tuna salad to take on vacation when late piano students arrived; they were -so- late I thought they had forgotten their lessons entirely, as they had done numerous previous times. Since they were my very last students on the very last Friday of my studio "year," I had started the chores I needed to complete before leaving for a sailing vacation. Just as the students arrived, the timer dinged (5 minutes), so I took the eggs off the stove and put them in cool water. (Julia Child says this prevents the "green ring" around the outside of the yolk. This was going to be a first-class vacation. No green-ringed egg yolks on this vessel!) I figured 5 minutes was enough plus the residual heat in the egg and hot water, in case I was wrong and it was 6 minutes or something. In any event, I had to stop cooking the eggs and go teach. After the lessons, it was time to finish things up. My family had arrived home and was ready to roll. All I had to do was cut the hardboiled eggs into a mince, mix them in, throw the finished tuna salad in a container, and we would be off. I shelled the eggs and put the first one in my egg cutter (that's the guillotine-like thingus that slices eggs with numerous pieces of thin wire bound together in a frame; if you turn the egg 90 degrees and do it again, and you get minced eggs; awfully clever). As I was pressing the slicer part down onto the egg, I said to myself, Gee, this white is awfully resistant; seems strange. So I soldiered on and then discovered in the most unfortunate of ways that the egg was not fully cooked! That was why the white was resistant. Of course, the yolk was quite surprised to be attacked by the egg thingus and reacted accordingly. Liquid yolk everywhere. On thingus, on counter.... My family was ready to roll. I have high cholesterol so I don't fix hardboiled eggs anymore, but I thought, For vacation, let's go all out. Eggs in our tuna salad. Whoopee! Obviously 5 minutes was too short for a hardboiled egg; I didn't remember how long to cook them since it had been so long since I'd made them (high cholesterol and all). Maybe it was 15 minutes. Yeah, 15 sounded a little more right. I didn't have 15. My family was ready to roll. I turned to my normal solution. I cracked the shell of the other egg. (I remembered something vaguely about making a hole so the steam could vent and not cause the egg to explode.) I put them both in the microwave to finish up. After about a minute, I heard a loud pop and rushed to the microwave. The partially-sliced egg had exploded. I salvaged what I could and put it in the tuna salad; at least now the yolk was fully cooked! I put the other egg in ice water. (No green rings for me! They probably creep up on you every time you cook the egg a little more.) After 5 minutes, the shell felt cold. Ok, time to slice this puppy and get out the door. My family was ready to roll. I shelled the egg and put it in the egg slicer and pushed the slicer part. Ah, this was better; going right through the white this time. But when I encountered the yolk, kaboom! The incredible non-edible exploding egg! All over the kitchen this time! In the silverware drawer! Down the front of me! In my hair! On top of all the "pretties" I keep on my counters! On the floor! (Some in the sink. Good shot!) My family was ready to roll - - and I don't mean on the floor laughing! Ah, well, we had fewer eggs than planned in the tuna salad. My doctor was happy, even if we weren't! The moral of this story is: never do eggs in the microwave. Never! No matter if you have this cool gadget you bought on TV. Do the eggs on the stovetop. No matter how pressed you are for time. Leave out the eggs! And also consult a cookbook for things you haven't cooked in a while. Last updated September 16, 2001.